EilBurns@aol.com or my home address is William Burns, 137 Oak Street, Pittston, Pennsylvania 18640. If you have a phone number, I would be happy to call him. I look forward to your response. Hi, I'm writing to you from the United Arab Emirates, current home of the 380th Air Expeditionary Wing. I'm also a former member of the 380th Bomb Wing while it was at Plattsburgh AFB NY until 1994. Just so you know, we're putting together a heritage tent in our compound that will capture the expeditionary nature of the 380 BG. We've named it Fenton's, after Fenton Field in Australia, our unit's first overseas "expeditionary" home base. It was researching for our heritage tent that we came across your webpage. I'll leave it at that for now, but I just wanted you to know that a. we're keeping the 380th name active and alive in today's warfight over here, and b. if there is anything in the way of (copies of) pictures, patches or any other paraphernalia, stories, etc you'd like to pass along somehow (we'll pay the freight), we'd be eager to find them a new home in the old unit. I don't know if you confine yourself to just the WWII 380 BG, but I am the vice commander of the existing 380 AEW, and was a 2lt thru Capt at the 380 BW, later the 380 Air Refueling Wing at Plattsburgh. As such I'm the only one here who has been in the unit at two locations. As such I have an affinity for any 380th related information. Here's a model I had reproduced of a 531st BS, B-24J "Sultan's Daughter" which was my grandfather's. I used the pictures from your website. Thought you might like this! My father, James Parker Benton, passed on June 24, 2007, in Kansas City, Missouri. Parker, as we knew him, was assigned to the 380th, 530th squadron, Harkins crew (38), "The Sandra Kay," named after my sister. Doing some research, the "Sandra Kay" had the most raids, 130. My dad flew 53+ combat missions and 380 combat flight hours prior to being set down, then he flew non-combat until he rotated back to the States. Question: How can I find out if there are any crew members still living that might have known him and flew with him??? Joyce Linda (Benton) Macdonald, daughter. My name is Keith Conrad and your 380th newsletter just provided a most amazing experience for me. 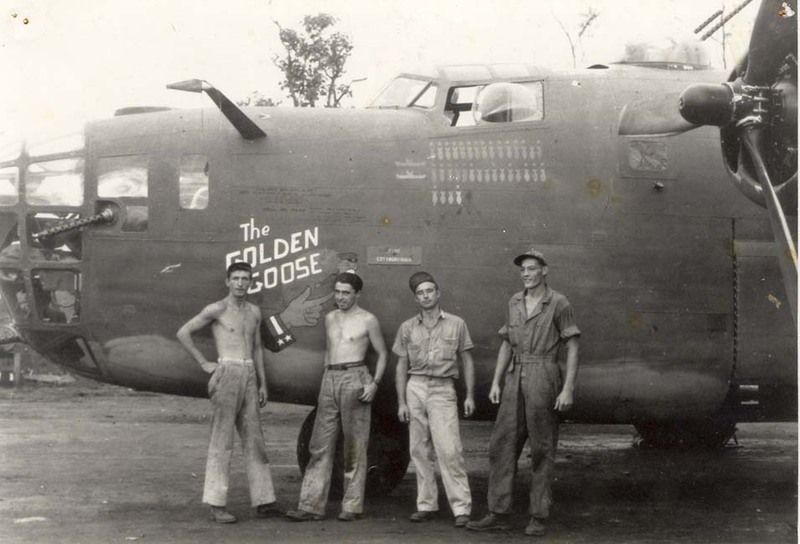 I'm currently living in Lagos, Nigeria, and was contacted by my cousin to see if I had the photo of my father, Basil W. Conrad, standing in front of the B-24 bomber, the Golden Goose, with the ground support team. My cousin, a professor at Boston College, wanted the picture to use in a presentation for education conferences in Boston and Tokyo. Unfortunately, the picture is in storage, but I said I'd do a quick search and see if perhaps the picture might show up on the internet (I'm an optimist). I quickly found your website and the roster listing for my father, but no luck with the picture in the main sections. As my optimism was waning, I noticed the newsletter section, clicked on the Fall 2008 issue and there it was in the Photo Gallery with comments provided by Dexter Baker. 'Gray' is actually my father! What a thrill that was for me and also my family. Dad passed away in 1987 and Mom this past Christmas Eve, but they must have been doing the steering yesterday. Thanks for making this little story possible and pass my thanks to Dexter Baker.